This church, founded in 1868, held its early services in a brush arbor. In 1870 trustees purchased this 1.75 acre tract to build a school, the first for black children in the Mars Bluff community. This sanctuary was built in 1875 and extensively remodeled in 1970. The cemetery includes the graves of such early church leaders as Anthony H. Howard (1840-1908), a former slave and local rice farmer who served in the S.C. House of Representatives during Reconstruction. 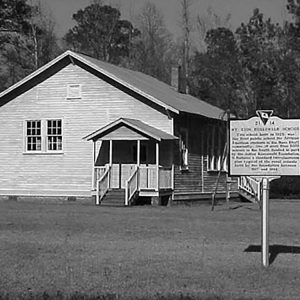 A new two-room schoolhouse, funded in part by the Rosenwald Fund, replaced the original school building in 1925. It closed in 1952 during the state’s “school equalization” campaign.